With the relative simplicity of the rest of the art, that boss strolling in makes it look really damn serious. It's a great contrast while also staying within the current artistic style. Major Apocaleague Baseball - Oregon Trail inelegantly cross bred with Baseball Management. Currently working on Silent Earth. Looks like you've made a ton of progress since I last saw you at IndieCade. There are a few small disadvantages to this new system. One, the game's drama feels a lot more centered on the player, instead of the city they are protecting. This is probably just a narrative detail I can find some way to lampshade or iron out. Two, I had to throw out the cool auto-targeting system I made for the force push - it was really obnoxious having the weapon automatically consume the player's energy while they were using it, even if it wasn't advantageous for it to do so. Three, it is currently possible to kill yourself by using up all your energy, and I haven't yet decided if I want to keep that in the game or not. I did make some other small changes - player explosions are now a bit smaller, requiring more careful placement of shots, and I drastically shortened the time it took to switch between weapons. All in all, Silent Earth is now far more exciting to play than ever before. I still have a lot of balancing work to do with this new system, but it definitely feels like a good move. I love the universal energy versus individual weapon ammo. Seems like an excellent simplification! One, the game's drama feels a lot more centered on the player, instead of the city they are protecting... Three, it is currently possible to kill yourself by using up all your energy, and I haven't yet decided if I want to keep that in the game or not. Might I suggest Energy not being Health, but still just Ammo? So then, if Energy is just universal Ammo, what would Health be? Well, instead of having a bar, just make the "Health" the representation of the city itself. You're already showing the city as buildings that are destroyed when missiles hit them. Why not make it so that, once all of the city is destroyed, the player loses? That way the player can't directly kill themselves by overusing energy, either. Taking feedback from TheWanderingBen, Mark Mayers, and others into account, I've come up with a final health/energy system I'm really happy with! I've added a shield that also draws power from the energy bar, and made the city a representation of persistent/static health. Currently, the shield completely shuts off when energy is reduced beneath 1/3 of the total, and the city beneath it is exposed to taking direct damage from enemy missiles. I still have a lot of balancing to do to make all of this feel nice and tidy, but I'm very happy with the extra depth the new health system has added. Next up, I'll be writing a post about the enemy formation system I've been working on! Alright, sorry for the slightly-longer-than-usual lapse in updates. I've been working on what is (probably) the last big gameplay tweak I'll be making before finishing the rest of the game's content and story. Previously, Silent Earth featured different weapons with varying properties/styles that you would switch between during combat. To select different weapons, you would use buttons placed at the bottom of the screen, sort of like the dock icons on a phone. The idea is that you switch weapons during play to create powerful emergent attacks (shooting with the horizontal line and then switching to the force push creates a shotgun, for example). While it was a cool concept in theory, I noticed that people really had trouble switching between weapons during the game, even when I tweaked other mechanics to provide more incentive to do so. They would typically try them out in the beginning of the game, and stick with whatever they were last using when the game's difficulty increased. No matter how good or fun a weapon was to use, Silent Earth's gameplay is too fast/reactionary to ask players to figure out what weapon would be best for them to use at the moment rather than just shooting with whatever is convenient. You'll notice that instead of the usual weapon buttons at the bottom of the screen, there are two modification slots instead. Dragging a weapon mod into one of these slots adds a new aiming reticle and explosion effect to the basic missile weapon. In the gif, I first add the line mod which adds a quick horizontal beam that destroys anything at that height across the screen. After that I add the force mod, which of course adds the force push effect to the explosion. To be clear, this will most likely not be a task that you have to deal with during the defense gameplay. I plan on splitting up the enemies into soft waves or phases, between which you'll be given a new mod or two and a short time with which to assign them to your slots. The old mods you aren't using will disappear when the next phase begins. Bosses will likely give you several mods to pick from. I am currently unsure if I should keep the draggable mods as being represented by icons, or have something more descriptive. In Metal Slug, weapons drops are described by a short abbreviation, usually one letter (S for Shotgun). I think that might work well but I need to test it! I like this system because it really, really simplifies the gameplay without removing depth. There's only one input now, which obviously is tapping the sky to shoot missiles. In addition, I can create many more unique mods than I can dedicated weapons, both because there is a much larger possibility space for mods than weapons (they don't have to be as powerful as a dedicated weapon) and the fact that I don't have to fit all of them on screen at once. I'm very excited to make a bunch of different mods and try out various combinations! I already have a lot of ideas for them. And two weeks later, we have this shiny new menu! The main concept here is that this menu expands in between phases of enemies. The phases are "soft", in that a phase will continue until a certain quota (currently 20) of enemies are killed by the player. So if you're not killing anything or taking a lot of hits on the shield, the phase will last longer. Currently there is no indicator of the player's progress through a phase, but that's on the way. This screen took awhile because I wanted the icons to function almost like Facebook Messenger chat heads, and in general make interacting with them as pleasant and joyous as possible. On mobile, you can flick them around and bounce them off of each other. 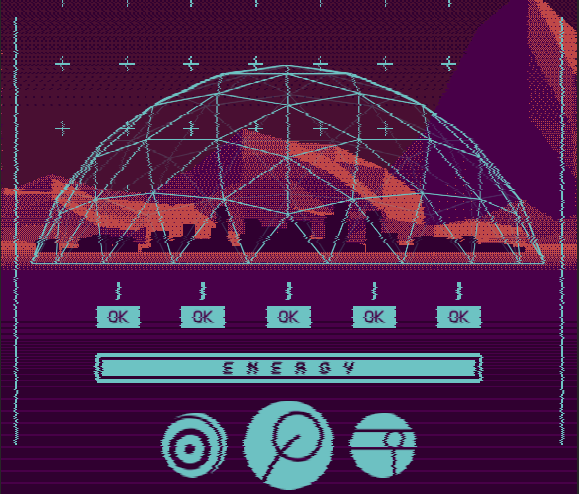 Just like all the other interface elements in Silent Earth, everything here is rendered and animated programmatically using quads and lines drawn with Vectrosity. I still need to fix some small things like the kerning on the text, and make the touch/flicking input on mobile a tad more fluid, but the menu works really well on the whole. Over the next week or so I'll be working on the first boss' gameplay, and possibly some more weapon mods if I have time. Cheers, and thanks for reading! I have absolutely been enjoying every update with this game. The aesthetics of the game alone would be enough to get me hooked on this. Congratulations! Quick update - the past few days I've been working on mechanical balance and performance optimizations. Missiles are now a bit more expensive, and the shield a bit more forgiving for when it goes down (just a little over 1/3rd of the energy bar). So far people are feeling pretty good about it. This pretty much just works by drawing all the explosions on a separate camera, along with a mask shader, which is just an unlit shader that only writes to the z-buffer. These are combined with some manipulation of the z-buffer where newer objects are pushed back to overlap explosions and masks. Next, I'll be making a polish/juice pass on the game, and starting to delve into narrative territory. As always, thanks for reading! Been lurkin on this for a long while. Love how much effort is being put into the visuals, I've spent way to long just staring at every gif. Really looks like something special. From a purely visual perspective I think the explosions look better without the masking, though it does make it more readable so I suppose that should win out. I've been super busy sending out builds and preparing for/tabling at a few conventions. Most recently I've added an attract mode like you'd find on an arcade machine (crucial for showing off the game to people, especially at conventions), and fixed a ton of bugs and general optimizations. We also have sound back in the game, which pretty much warrants a whole post on its own where I'll cover our sound design and integration techniques. Since it doesn't actually attack the city, it takes two hits directly to its body to kill it. Being that it takes up such a large amount of the playable area of the screen, I'm spawning them pretty rarely right now, maybe twice in a round at high difficulty. It also takes two hits to kill. As such, it almost feels like a mini-boss, even though they don't do any direct damage. I might nerf or make it smaller so that I can spawn more at a time, but currently they are quite fun and add a lot of spice to the gameplay. I am very interested in coming up with a lot more technical or "puzzley" enemies like this one, or at least enemies that augment or play off the strengths of others to make gameplay more varied. It might also be nice to do "themed" waves, such as a wave of few but very fast enemies, or a wave with lots of technical enemies like the one above. You may have also noticed that there are now four missiles instead of five - at Makerfest RVA I got a really good response to completely unlimited ammo (you can keep firing when out of energy), and increased missile energy cost + increased energy back from chains. The shield now represents the entire energy bar, and only goes down when you've completely emptied it. In other words, the game plays very similarly, but a higher emphasis is now placed on energy management, and the relationship between firing and the shield is a whole lot clearer, especially for new players. In other news, I'm very happy to say we have made it past round one of selection for the Magfest Indie VideoGame Showcase! We're making a big content push to get a build together for round two, so expect a lot more updates in the next two weeks as I'll actually have interesting new stuff to talk about and make gifs of. As always, thanks for reading! I figured he would be a good variation on the normal missile enemies for later levels. Tying a lot of this stuff up today, so I'll have some full gameplay gifs for you guys later this week! Silent Earth's first boss is up and running, along with a bunch of other new features! He has three stages of varying aggressiveness/difficulty. In this gif, he's in the second stage where he's at his most aggressive - he'll try and shoot at you while drifting into position, and focus the beam for longer than the other stages. The first stage is the least difficult so the player can learn how to fight him, and the last stage he plays much more cautiously, trying to outwit the player by dodging frequently and taking pot shots. Currently it takes 12 direct hits to kill him. At the moment I don't have any kind of health bar or special UI for the boss, but I'm almost okay with the boss' health bars just being their own behavior, because the stages are (to me) quite distinct. This also fits into the narrative in that the software you're using wasn't designed for fighting against these guys, which might make them more interesting/scary if I play that up. On the other hand, going full blown UI with a boss title-card and all could be an epic homage to the boss fights I loved/feared as a kid. The laser beam does need a bit more work - I can't have collisions on the blast circles for performance reasons, so it's doing a pretty basic (fast) circle line check to see if it intersects any of them. To make it feel more fair, it adds half of the current width of the laser beam to each circle's radius when it does the calculation which is what makes it stop short and clip like that. Basically, I just need to think of a cool effect to put on the end of the beam that will mask the clipping, and tweak the animation values some more. And of course, their overall progress through the round. I've also been working on modifying the spawning system to include more varied waves and make room for more authorship on my part, but the details there are pretty in-depth so I'll save that for the next post. Thanks for reading! Hey everyone! I've just spent a week and a half optimizing the game from the ground up. It's very fast now, and likely won't require any further polish in this area if I continue to be mindful about performance while adding extra content. Currently the game idles about 23 batches, and peaks at about 35 when fighting a boss. This is down from about 35 - 70 respectively - a massive improvement in that area. There are two other big optimizations that made a significant impact. The first was removing all palette code from the shaders themselves, and instead replacing it with a scripted callback that manually updates the colors on each material when the palette changes. This means that stuff like the GUI labels and mountains are the only things in the scene that require a tex2D() call in their shaders, which drastically reduced VRAM consumed by the game. I also consolidated most of the game's materials (this helped with batching, obviously) down to 6 materials, not including the boss (which uses 4 by itself). The other big optimization was with Vectrosity, the plugin that handles all of Silent Earth's line rendering (literally all of it, including the GUI) - I had overlooked the fact that if you use Vectrosity's standard material for lines instead of a custom material, it will draw all the lines in the scene, regardless of poly count or color, in one draw call. Silent Earth is super mega line heavy, so naturally taking advantage of this improved performance drastically. Finally, I've also got the game's garbage collection down to near-zero. I'm certainly very proud to say that none of my code generates any garbage (!!! ), but unfortunately there is still some unavoidable garbage generated by FMOD, our audio middleware. I could probably go and mess with their source code to try and alleviate it, but currently it peaks about 83B/frame which is probably in the realm of minutae. This didn't yield as much of a performance increase, but it did make garbage collection much, much easier to conceal from the player, as I now trigger it manually after each wave.